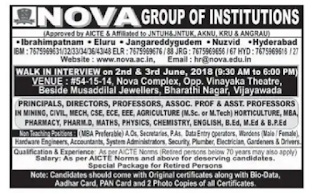 Nova Group of Institutions, Hyderabad has advertised in THE EENADU newspaper for recruitment of Principal, Director, Professor, Associate Professor, Assistant Professor jobs vacancies. Interested and eligible job aspirants are requested to walk in interview on 02.06.2018,03.06.2018.Check out further more details below. It gives us immense pleasure to introduce to you the yeomen service being rendered by Nova Educational Society formed in the year 1998 by a group of eminent educationists and philanthropists with the sole aim of providing Quality Education to one and all, to both the Urban and Rural populace with equal measure. The Vision of Nova Educational Society is to emerge as an “Organization of Excellence” offering world class Professional Education and prepare the students to meet Global Challenges of the future with courage and conviction. 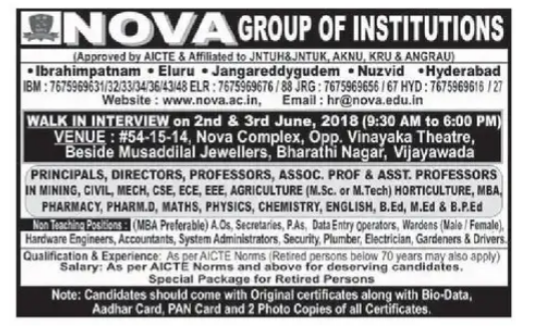 Towards realizing this Vision NOVA EDUCATIONAL SOCIETY embarked upon the Mission of establishing Institutes of Technology & Research, Colleges of Pharmacy, Colleges of Education & Colleges of Management at different campuses spread over various parts of Andhra Pradesh. They offer both UG and PG Programmes in a variety of courses. Among these some of them are exclusively for women. Special package for Retired persons. How to apply: Interested and eligible candidates can attend date and time interview:02. 06.2018,3.06.2018 from 9. 30am to 6pm. Venue:Nova complex ,Bharathi nagar, Vijayawada. Candidate should come with original certificate along with bio data,aadhar card, pan card, and 2 photo copies of certificates.